Our September juried group show features twenty-four artists, some represented by multiple pieces, whose works challenge the standard definition of jewelry. 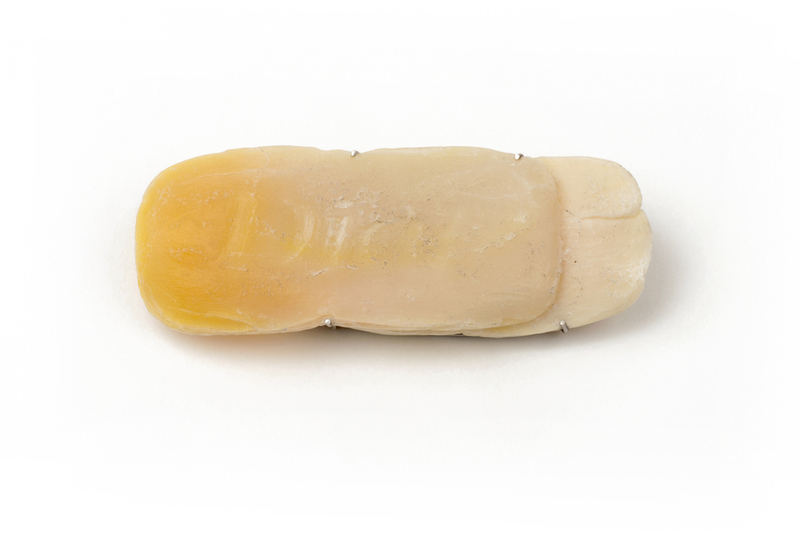 These pieces are evidence of the diverse and ever-changing field of contemporary art in jewelry making. The practice of creating or using art forms for or on the body has evolved alongside humans for thousands of years, as have materials, techniques, and societal acceptance of wearable art. This exhibition highlights artists whose works are more than decorative; some are perhaps beyond wearable. These works leave us to ponder dichotomous themes such as comfort versus beauty, while the artists suggest varied descriptions of the role played by these adornments for the body – defined as beautiful object, armor, or even narrative. An esteemed jury has chosen works by 24 national and international artists based upon artistic excellence, innovation, and originality. Elizabeth Williams is the David and Peggy Rockefeller Curator of Decorative Arts and Design at The RISD Museum. Williams holds a Ph.D. degree in art history from the University of Kansas, researching the influence of Japanese design on American Silversmithing. Kerianne Quick is an artist, contributing designer to Gijs Bakker's Chi ha paura...? project, current Visiting Assistant Professor of Metal at SUNY New Paltz, and as of fall 2015, Assistant Professor ofJewelry and Metalsmithing at San Diego State University, two of the country’s top Jewelry and Metalsmithing graduate programs. 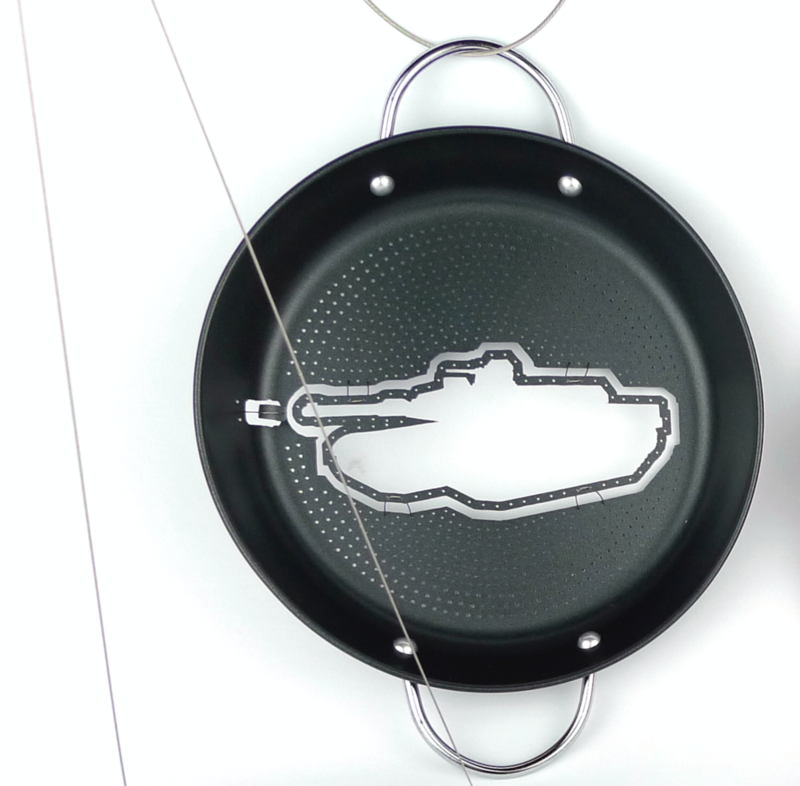 Quick’s artwork is the product of careful research and conceptual explorations. Reneé Zettle-Sterling is an artist, Associate Professor of Art and Design at Grand Valley State University and the President of SNAG (Society of North American Goldsmiths.) Zettle-Sterling works in a broad variety of mediums, making body-oriented sculptures and wearable contraptions that explore human relationships, memory, ephemerality, and our interactions with our surroundings. 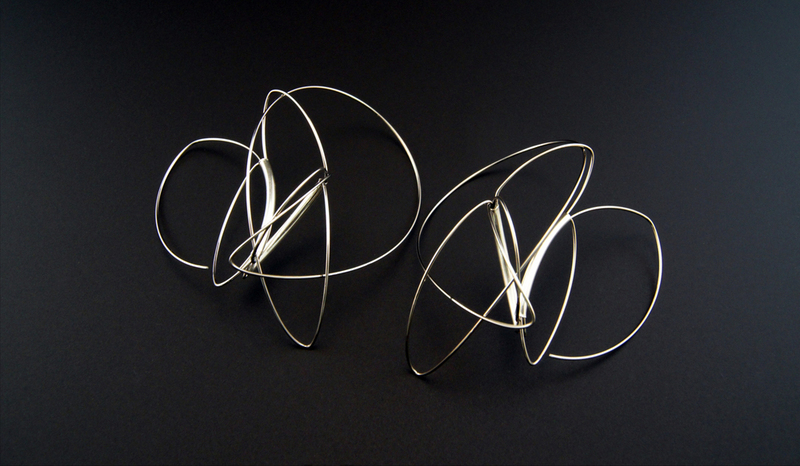 Her work has been featured in Metalsmith, American Craft, and the 500 series. Annie Sibert graduated with honors in 2009 from the art school in Strasbourg, France (HEAR). She made an exchange in the art school of Geneva in 2006 in the jewelry department. She also spend several months learning blacksmithing in 2007. Since then she has been working as an artist and has been sending her time developing her love for metals. Her work was shown in the prestigious exhibition Dans la ligne de mire of the Musée des Arts Décoratifs of Paris in 2013. 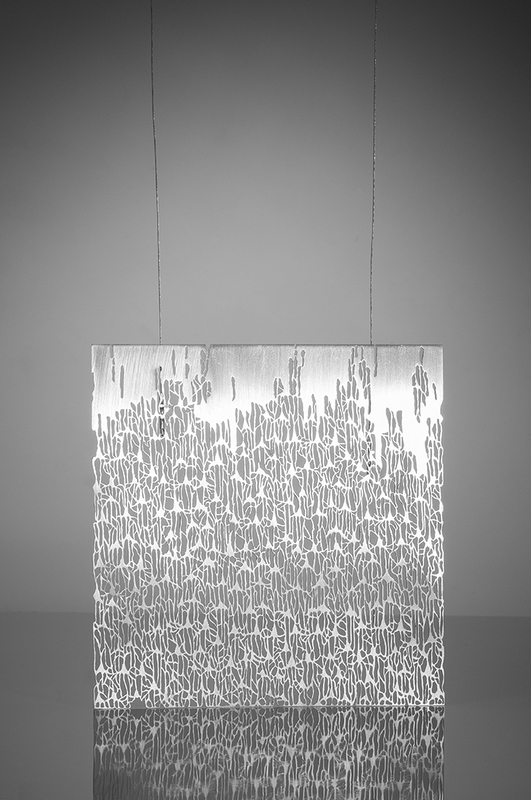 She also won the 2012 young creation award of Atelier d'art de France. I create series of rings that i call Portable Sculptures. They constitute sensitive experiences of the workshop : I take in the smell of the various metals, I experiment on their malleability, I play with their colours, i test their limits and those of the tools i use. With each new trial, I combine the materials and imagine shapes and techniques to design large rings. My relationship with a jewel is definitely a playful one: I put it on, take it off, exchange it, set it down, put it back on. As my rings are sometimes very heavy, the wearer has to be cautious; wearing an object becomes a very special experience, something that means more than just dressing up. Caitlin Skelcey is an artist presently pursuing her MFA at the University of Illinois Champaign Urbana. While primarily a digital metalsmith, her work is often a reaction to the surrounding world; a coping method where things, people, and events in the world manifest themselves through shape and material experimentation, technique, and perseverance. 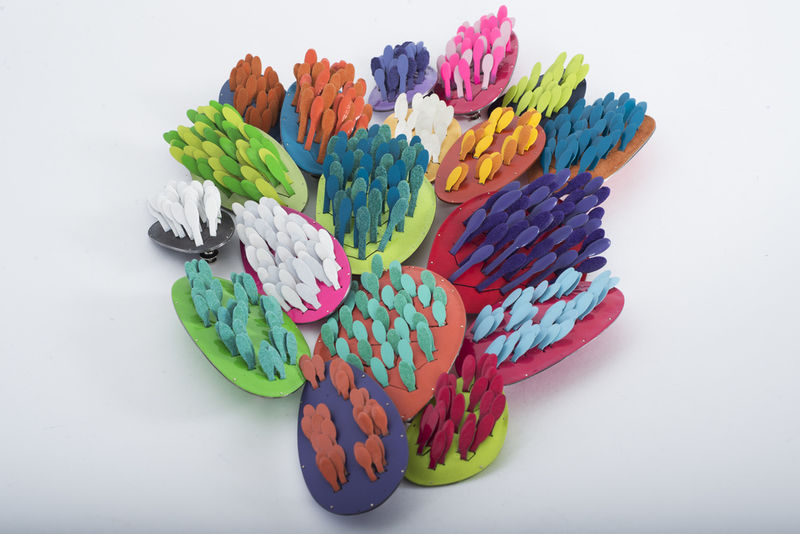 It is driven by exploration of technique and involves elements of both traditional techniques and 3D computer modeling and 3D printing processes. She aims to take what shocks, arouses, inspires, and horrifies in the world and create forms that reflect a distortion of these influences into a thoughtful and compelling body of work. 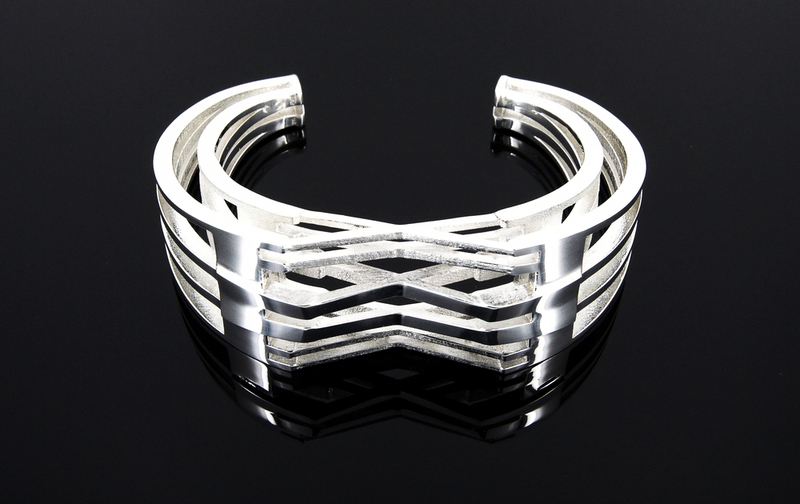 A sawed-apart 3D-printed bracelet, this piece began my interest in taking apart printed pieces and the idea of fragmentation and mechanical failures. The bracelet now exists as a set of brooches. Jacqueline Lung is an artist currently completing her BFA in Jewelry and Metalsmithing at Rhode Island School of Design. She previously studied at the HDK School of Design and Crafts in Gothenburg, Sweden. 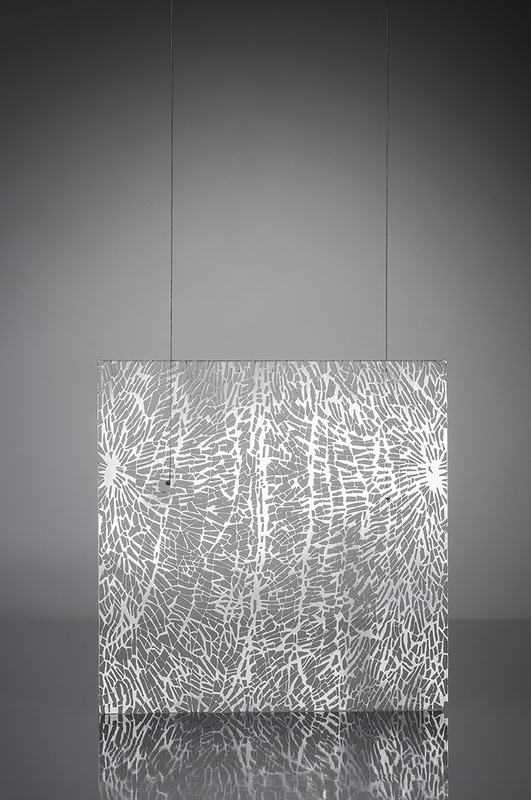 Her work is an ongoing investigation in materiality and value, often integrating digital fabrication with traditional metalsmith techniques. This is a set of five signet rings worn on the fingertip of each finger. Each ring is set with a plexiglass signet that has the corresponding fingerprint laser-etched on the inside. The fingerprints can be seen and touched from the inside, but the wearer leaves no fingerprint, reversing the function of traditional signet rings as a form of identification. Jennifer Roderick, a recent graduate of Rhode Island College graduated with honors in May of 2015 with a Bachelors of Fine Arts in Metalsmithing and Jewelry Design. She recently won the Rhode Island College Graduate Senior Award of 2015 and was showcased in the Providence Journal on May 31, 2015 in an article titled “RIC Grad’s Stunning Metalwork.” Jennifer took on the role of curator for the Student Exhibition Show “Metallurgie” at Rhode Island College in the spring of this year. In her free time, she enjoys spending time with family and friends, reading, traveling, cooking, and collecting vintage movie stills. Jess Tolbert is a maker and educator living in El Paso, Texas. She received her BFA in Metal/Jewelry from Texas State University, San Marcos in 2009 and an MFA in Metal from the University of Illinois at Urbana-Champaign in 2013. She recently completed a year long Artist-in-Residence with the Metal Department at the Southwest School of Art in San Antonio, Texas, where she also adjunct taught. She is currently Visiting Assistant Professor of Art at the University of Texas, El Paso. Tolbert’s research and studio practice focuses on the function of the hands, the everyday, and the making and manipulation of objects. I am interested in the power objects have to connect people to their individual and collective experiences, whether they are meaningful, evocative, or mundane. In looking toward everyday objects and common materials I aim to draw out our deeper connection to things through a collision between personal and cultural associations. In this instance the safety pin, as a notion of rebellion, exists and collides with the useful and beautiful. His design practice is informed by modernism and minimalism and driven by material exploration. He utilizes both traditional and contemporary designing and making skills to bring form to his artistic vision. Instead of making works from found objects, every element of his jewelry has been designed and engineered from blank blueprints. All of his jewelry is comprised of multiple geometric elements and married into abstract modules that repeat in order to create an elaborate form. The design process then pushes the limitations and error range of the technology he is using to achieve a dynamic form composed of simple elements. 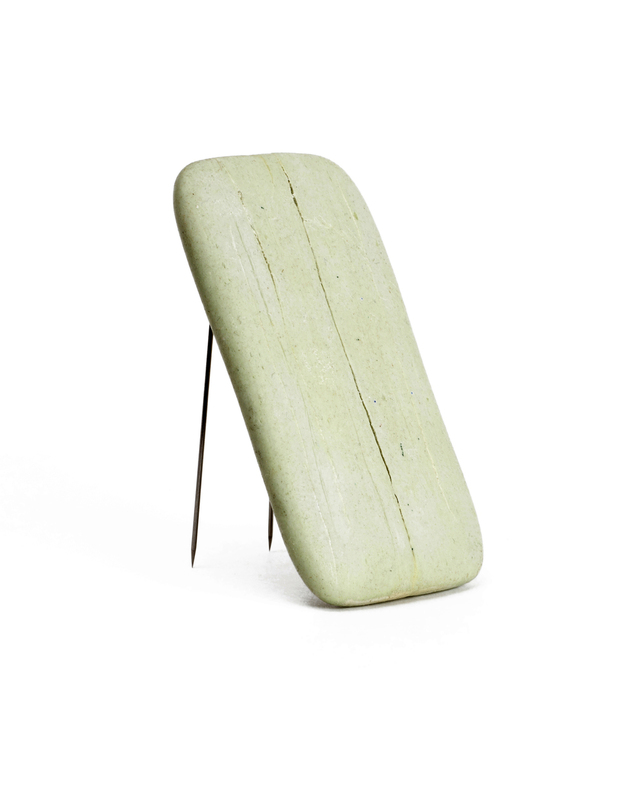 Joshua Kosker is an artist and metalsmith from Western Pennsylvania. He completed his MFA in Jewelry Design and Metalsmithing from Bowling Green State University in May 2015, and received his BFA in Studio Art from Indiana University of Pennsylvania in 2011 with concentrations in Jewelry/Metals and Painting. His work has been exhibited in various national and international exhibitions. Most recently he has been the recipient of the Excellence in Metals Award at the Ohio Designer Craftsmen Best of 2015 Exhibition, the 2015 Society for Midwest Metalsmiths Merit Scholarship and the Ethical Metalsmiths' Emerging Artist Award. Separated from or existing without the body, soap serves no purpose and is generally discarded once it reaches a certain state of reduction. Transformed through the daily ritual of bathing, these forms convey a tactile, intimate relationship between owner and object. By reconnecting this material to the body as jewelry, I aim to evoke a sensual experience about the simply pleasures of bath time, with intentions of a more private dialogue. My pieces tell stories. They tell of storms weathered and whitewater navigated. I collect things while I am wandering in wilderness, seduced by the cast off flora littering the ground beneath my feet. They are scored with lines and scars depicting their histories and hinting to aspects of the primitive environment we deprive ourselves of. They are a part of the natural cycle, undisturbed, and I aim to highlight their undulations and subtleties. Each piece serves as a sketchbook, or journal, of where I have been and what I have seen. By cutting wood, I discovered the beautiful, hidden remnants of time and erosion. I placed these secrets by the body and secured them with simple, industrial pins. 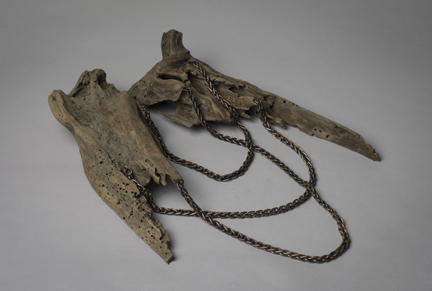 The light weight sections of wood are joined by heavy, thick chain, which both restrain and adorn nature. I see my jewelry as layered paintings- collages with dimensional elements that allude to a story. The stories are about loss, something that touches us all eventually, but also about the beauty of life. If I can make death and the subsequent feeling of loss something beautiful, I can soothe my fear of future loss. We all carry these experiences of life and loss within the inner layers of our being, and I see my necklaces as a way to wear these moments on one’s outer layer. I pared down my palette to black and white, using the bones as a natural clean white, and the butterflies graphic and stark black resting on the bones themselves. The bones symbolize ones passing, as well as the butterflies are passing by- stopping only to pause for a moment. 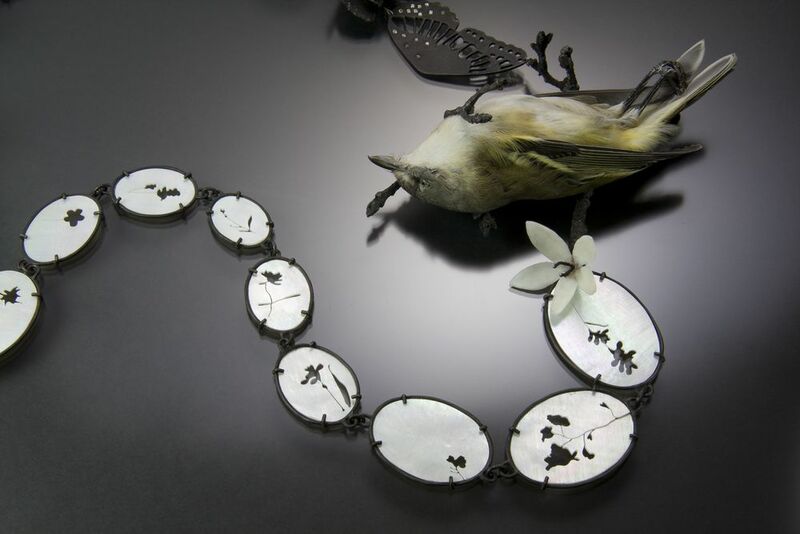 Kelly Nye received an MFA from California State University Long Beach with an emphasis in Small Metals & Jewelry and a BFA from Columbus College of Art & Design in Columbus, Ohio. She currently teaches foundations, sculpture and metals/jewelry classes at CCAD and Capital University. She is the 2015 recipient of the Crafthaus/Society of North American Goldsmiths’ Conference Scholarship, the Dr. Judith Temple Scholarship to Arrowmont School of Crafts and was featured in the book The Art of Paper Jewelry by Marthe Le Van. This work is from the series titled "a room with some lace and paper flowers." These pieces are all traditionally hand pierced 24 gauge sheet metal and soldered and spray painted with a matte finish. The variety of whites emulate lace and the subject matter of varying florals build the lattice structures. These pieces become physical drawings of jewelry forms that are meant to hang on the wall and lack wearability. Lindsay Miś currently lives in New Bedford, MA and is CraftBoston Show Director at The Society of Arts and Crafts in Boston. Miś received her MFA in Jewelry Metals in 2013 from UMass Dartmouth and her BFA in Craft/Material Studies from VCU in 2006. She has worked at art institutions such as New Bedford Art Museum, Haystack Mountain School of Crafts, and the Visual Art Center of Richmond, VA. Miś maintains her metalsmithing practice in an old fiber mill in the SouthCoast. Sculpture and jewelry often overlap for Lindsay Miś. Her work investigates connections between people and our lack of face to face interaction in social environments. 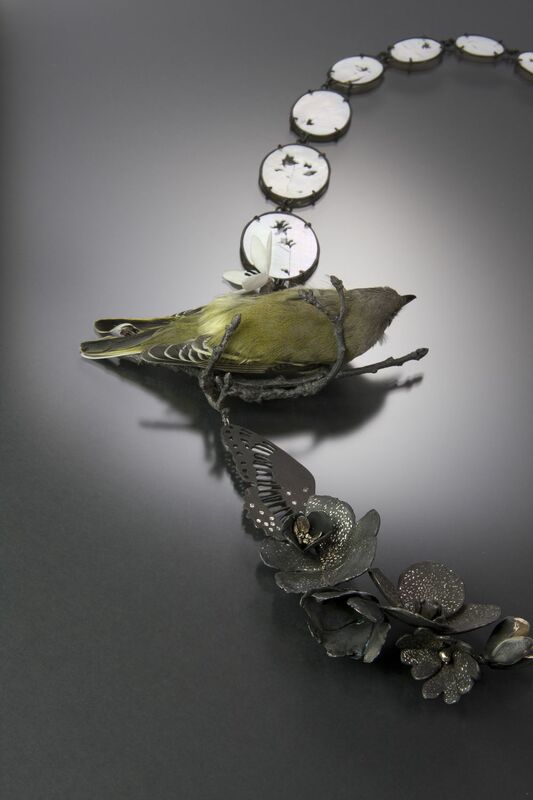 She re-uses scrap steel, precious metals, wood, and string to construct her pieces. Her techniques range from the physical realm of forging to the delicate intricacy of stone setting. I aim to amplify the body through applied form. I utilize the format of jewelry because of its relationship to the body, and apply ornamentation by utilizing pattern and color as a means to create structure on the body. I source pattern from Alexander McQueen’s 2010 series, Plato’s Atlantis, where animal skins were digitally manipulated into fabric patterns. My work appropriates the patterning from a specific dress within the series and replicates it in industrial materials, creating jewelry objects that become skin again on the body. I am interested in the layering of meaning created when animal skins are appropriated into fashion objects. The appropriated patterning from the McQueen Dress is made of butterfly and snakeskin patterns in electric yellow, green, and blue colors. My work mimics this patterning and coloration of the dress to return the pattern back to the body. This centered, symmetrical pattern in a bold hue refers to an animal’s high level of danger in the natural world: the intensity of the color suggests its level of poison. By making this object in metal I create a layer of armor and protection on the body. This enables the wearer to take on the original effect of the natural animal skin; operating simultaneously as an attractant and repellant to the body. 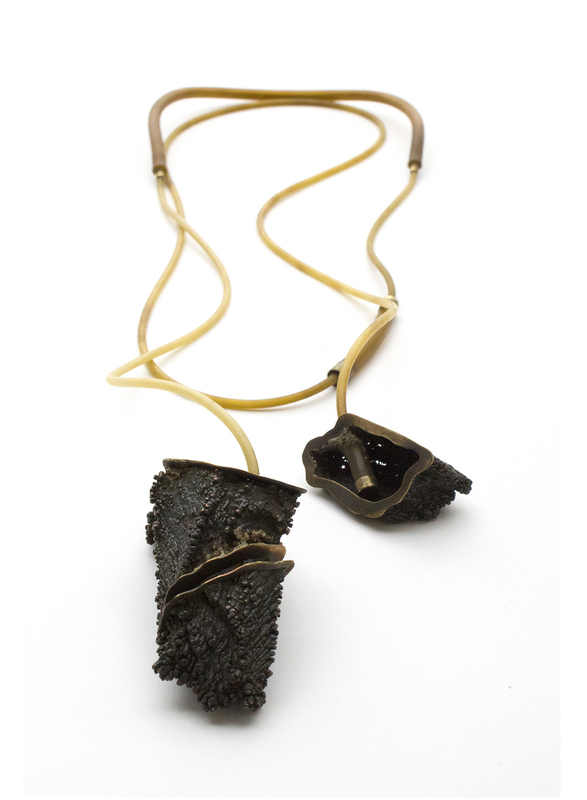 Maia is a contemporary jewelry artist who seeks to question the idea of improvement. Maia graduated from Tufts University in 2008 with a degree in Biology and Community Health. After two years in the field of kidney research in Boston, Massachusetts, she quit her job and moved to Gatlinburg, TN to participate in the work-study program at Arrowmont School of Arts and Crafts. She continued her education at Pocosin Arts in Columbia, NC and opened a gallery there. She now is a studio artist and instructor in Chicago and working towards her Masters in Fine Art at SUNY New Paltz. Her work has been shown internationally at Schmuck in Munich Germany, and juried shows throughout the United States, such as The Florida Craftsman Gallery in St. Petersburg, Florida and the Maria V. Howard Arts Center at the Imperial Centre in Rocky Mount, North Carolina. Marissa Saneholtz makes narrative based jewelry and objects using humor and sarcasm to comment on gender roles in American society. In 2008, Marissa earned her BFA in 3-dimensional design from Bowling Green State University and her MFA in 2011 in metals and jewelry design from East Carolina University. For two and a half years after graduating she instructed metalsmithing, jewelry and enameling courses in Certaldo, Italy for East Carolina University’s Italy Intensives Study Abroad Program. She is currently working at J. Cotter Galleries and Studio in Vail, Colorado as gallery manager and assistant studio manager. By referencing housewife ideals that were created in the early and mid 20th century and putting a modern twist on vintage graphics, my work is an attempt to converse about the loss of innocence, gender issues, and my search for identity in today’s society. The closer I get to defining my own place in the world, the less idealistic I become. In the world of comic books and fairytales, the good guy always wins and prince charming saves the damsel in distress. This work attempts to reference those ideals with cynicism and sarcasm. Australian-born artist Melissa Cameron lives and works in Seattle, WA. She received her MFA in jewelry and metalsmithing from Monash University and a BA (hons) in interior architecture from Curtin University. Her works are in the collections of the National Gallery of Australia, the Cheongju City Collection (South Korea) and the Arts Centre Melbourne (Australia). She exhibits worldwide, and her publications include Jewel Book, Art Jewelry Today 3 and Lark Books’ 500 Silver Jewelry Designs. She is the recipient of multiple grants from the Australia Council for the Arts and in 2014 received a Fellowship from Artist Trust in Seattle. I have so far created twelve works in jewelry that illustrate specific weapons, in a series that itself charts each object’s history as relates to the other weapons depicted, forming a kind of loose family tree of military technologies. The works that form the series with a series, Gun, I see as a modern replacement of the professional soldier’s sword, so together Sword and Gun form a branch of this tree. Conceived to present a historical continuum, the Escalation series pits ancient and modern military technologies against one another, prompting the viewer to question humanity’s continuing relations with humanity. Missy Graff-Ballone is an emerging art jeweler who graduated with her MFA from the State University of New York at New Paltz in 2013 and her BFA from Montclair State University in 2011. Her work has been exhibited internationally at venues including the Pinakothek Der Moderne of Munich, Germany, Alliages in Lille, France, Brooklyn Metal Works, and the Heidi Lowe Gallery. Graff-Ballone is also a writer for Art Jewelry Forum, where she interviews artists and gallery owners from all over the world. Fascia is the connective tissue that binds the body’s internal structures together. 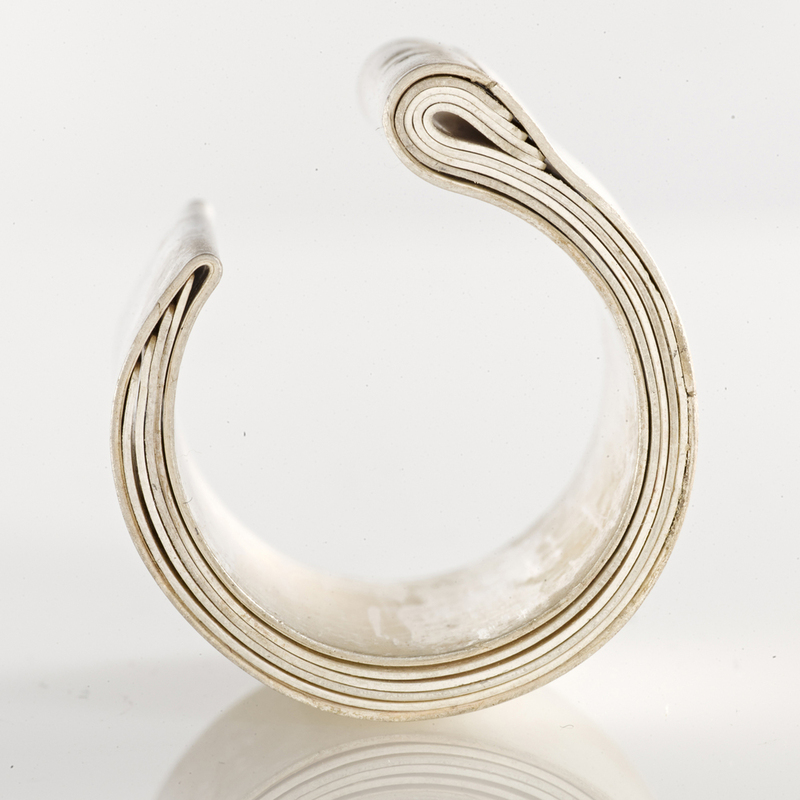 This series expands on my previous work and explores the intricacy of connective tissue and notions of flexibility through the format of jewelry. 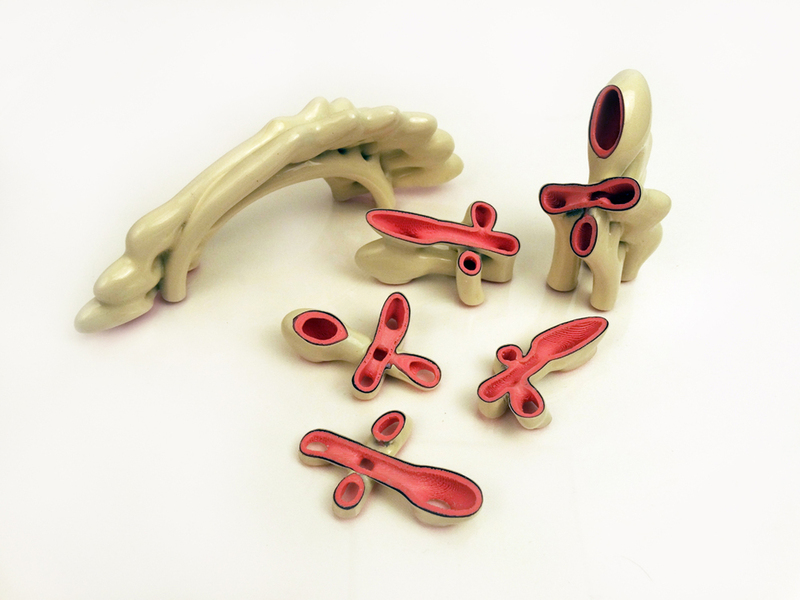 "Connected" is made of a skin safe silicone rubber that may be stretched to twice its size. Monica M. Guerra was born and raised in Los Angeles, California. She received her BFA from California State University, Long Beach in 2010. Guerra completed her Masters of Fine Arts degree at University of Massachusetts, Dartmouth in 2014. Her work has shown in galleries and museums across the United States and Mexico. 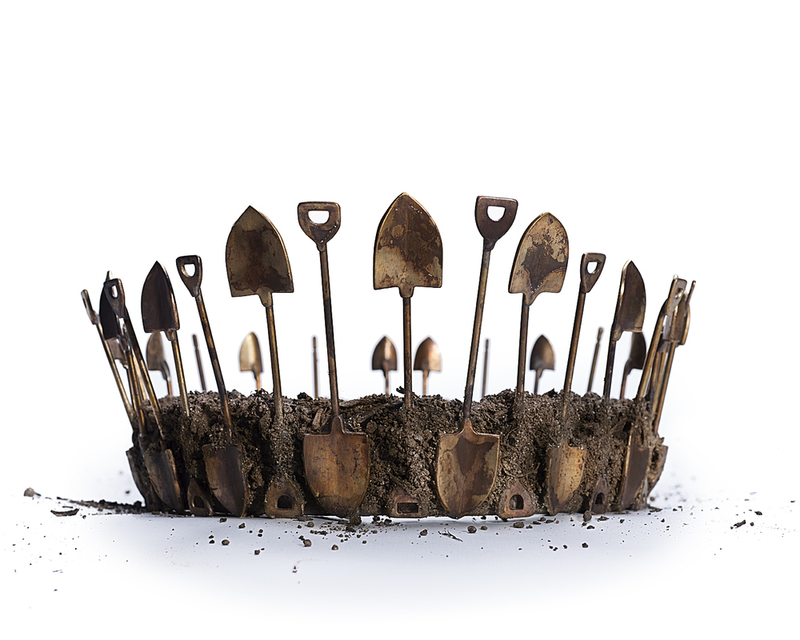 Miniature labor tools are fabricated and embedded into resin-impregnated dirt in the form of a crown. By juxtaposing a crown, a representation of a social class sequestered from the remainder of society, and the material, dirt I am aiming for a visceral reaction in the viewer. In this object, Mexico's crown jewels are satirically seen as its labor force. Nick Heyl spent the early years of his childhood orphanage-hopping in the ice cube of a country known as Russia, where he took care of himself and his little sister. At the ages of eight and five they were both brought to the United States and adopted by a caring family from North Carolina. For Heyl, the newfangled and unfamiliar place presented a cross-cultural learning curve, which he later explored in his artistic work. In 2012, he graduated from East Carolina Univsersity with a Bachelors degree in Metal Design and three years later, received his Masters degree in Jewelry & Metals from the University of Massachusetts Dartmouth. Artifice: Exchange is a device that both facilitates and hinders the act of "eskimo kissing" -- bumping noses as a means of affection. 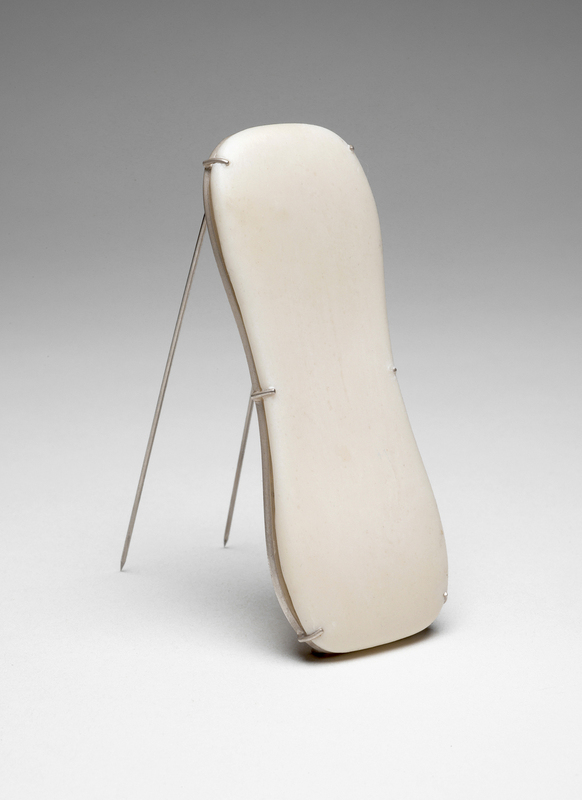 With its two handles, this object suggests a cooperative interaction between two individuals. From either side of the object, the users exchange breaths by blowing air onto a vertical disk that houses a mesh-like fabric membrane, propelling it like a sort of "sail". This act of exchanging breaths in turn pushes a soft, feathery element attached to the top of the disk across a rail -- gently bumping it into the nose of the other person. Artifice: Handholding Device is a double-ended handholding object capable of both contracting and expanding. Suspended in the middle of this device is a glass sphere filled with steel dust particles, which is held in place by four magnetic components. Initially this device might appear to be holding or perhaps even protecting the small, fragile sphere. However, as soon as the two rings begin to compress towards each other, the wiry sections holding the sphere in place begin to move away from it; the more the users compress their hands, the closer the sphere comes to falling, and inevitably, shattering. Memoir to My Mother The brooches in this piece are stand alone -- separate from each other; however, they have the ability to interlock together and become one unit. While both share a similarly built structure, they have entirely different functions. One of the brooches is mostly all structure with the exception of one small egg. This egg sits nestled somewhat precariously in the center of the piece and is reflected on an adjacent mirror-like component, symbolizing a reflection of the "self". Th second structure, fabricated with the same elements as the first, is a cylindrical, cage-like form made with cotton. This cotton-cage, when connected to its counterpart, intimately houses the egg, creating a padded sanctuary -- a place of refuge for the otherwise vulnerable object. Rene Lee Henry was born in Scottsdale, AZ, and relocated to San Diego, CA in 1990. She received her BA in fine arts with honors from San Diego State University in 2013. Currently she has a studio practice making one-of-a-kind and limited production jewellery in San Diego, but will temporarily be relocating to participate in Houston Center for Contemporary Craft’s residency program in January 2016. She is co-founder of VAR Collective, a group of makers that promote local contemporary craft. Her work has been selected for exhibitions across the United States and published in “Showcase 500 Art Necklaces” by Lark Publishing. Man-made constructs struggle for existence in a world ruled by nature. Structures left untouched will fall into disrepair; yielding to the effects of corrosion, erosion, and decay. During this process of reclamation, the artificial and natural coexist in a clash for dominion; but human creations will all eventually succumb to nature's absolute power. However, consciously or not, we continuously care and cultivate our creations to stave off the deteriorating effects of nature's hand which relentlessly works to break it down until reclaimed through the passage of time. This process and its effects are what have influenced this work. Samantha Nania is originally from Stratford, Connecticut and holds a BFA in Jewelry Design from Pratt Institute. Her mother instilled a mentality of preciousness in her, the idea that everything you own or come into contact with should be cared for in a precious way. Jewelry, for her, has always catered to this idea of ‘preciousness’. Her goal is to re-create how jewelry is worn and how it stands alone when the pieces are not on the body. 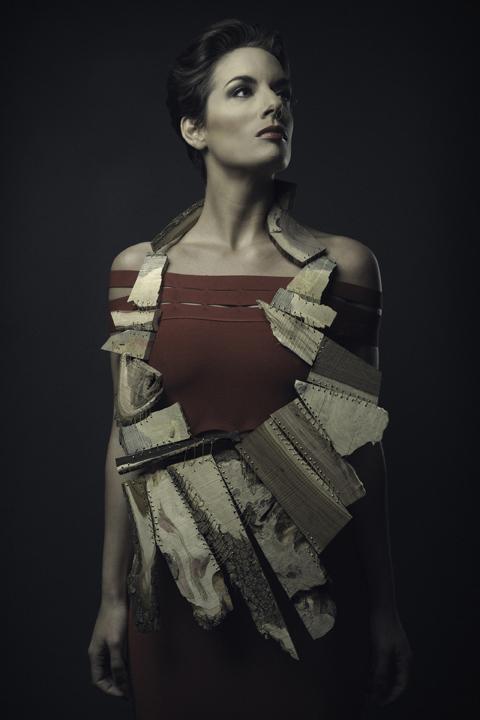 Samantha creates pieces that cross between art, jewelry and sculpture. She is interested in reducing her material waste and finding uses for the smallest bits of materials. Samantha wastes no metal, saves all of her scraps and carefully chooses her saw marks before cutting in order to optimize the use of her materials. Much of her work incorporates woods that are excess cutoffs from furniture making and flooring installation. Samantha reduces her material waste by seeing potential in all materials and using materials that are too “small” to utilize, unless of course, you’re a jeweler. Sarah T. Roberts lives in San Antonio, is resident artist and co-director of Clamp Light Artist Studios and Gallery, and teaches at the Southwest School of Art. The development of Roberts’ artwork centers on the early death of her mother. Inspired by her mother’s clothing, Roberts uses metalsmithing techniques to transform patterns of lace into fragmented faces. This repetitive manipulation of the “fetishistic” object uncovers a fascination of contradictory concepts, which allows both fact and fantasy to exist side by side. Her fears and desires that result from this trauma are simultaneously purged and held close through the artistic process. Sharon Portelance is a studio jeweler and has been a professor and Chair of the Jewelry and Metalsmithing department at Maine College of Art since 1999. She has exhibited and lectured both nationally and internationally and has been featured in a number of publications that include Ornament and Metalsmith magazines. Sharon lives in South Portland, Maine where she is currently developing a new body of work that explores the relationship of the interior of the body to the exterior of the body, while continuing her ongoing investigation into the nature of jewelry and how it can operate both privately and publicly. Steven Gordon Holman was born in 1988 in Leaminton, Utah. His work is a reflection on his rural upbringing, a collection of stories, myths, and iconographies both personal and cultural. Holman's work has been included in exhibitions including Talente 2014 and Staring: In Hindsight in Munich, Germany in 2014, as well as in printed publications such as Current Obsession Schmuck Paper, Remix Magazine, Vogue Russia, and Oyster Magazine. In 2013 Holman was the recipient of the Finlandia Foundation National Cultural Grant for creative research in Northern Europe. In 2014 he completed his MFA exhibition, The Tribe: Talismans, Amulets, and Objects of Remembrance, at the Samuel Dorsky Museum of art in New Paltz, NY. Holman received B.A. 's in Visual Art and Architectural Studies from Brown University in 2011, and his M.F.A. from the SUNY New Paltz Metal program in New Paltz, NY in 2014. Tamar Navama is an interdisciplinary artist, designing production jewelry, creating handmade leather products, and making one-of-a-kind metalwork. Her jewelry combines precious metals, exotic skins & imitations of exotic skins. Through her work, Tamar brings awareness to the complexities of how our culture relates to leather. She utilizes traditional handwork techniques alongside contemporary digital technologies. Originally from Israel, Tamar earned her bachelor’s degree in Metalwork from Bezalel Academy of Art and Design in Jerusalem. Following her move to the United States, she created custom designs for luxury leather goods in Fort Worth. She is currently earning her master’s degree at the University of North Texas. Tamar participated in New York Fashion Week 2015 as well as in international art exhibitions such as “Look Far” at The U. Nahon Museum of Italian Jewish Art in Jerusalem, "Identifying Marks" Tova Osman Gallery, Tel Aviv, and “I Care A Lot: Middle East Portable Discussion” an international jewelry exhibition traveling to Stockholm, Sweden, Lisbon, Portugal, and Frakfurt, Germany, She has been featured in an Israeli TV show, and has curated a contemporary metalsmithing art exhibition in Tel Aviv. 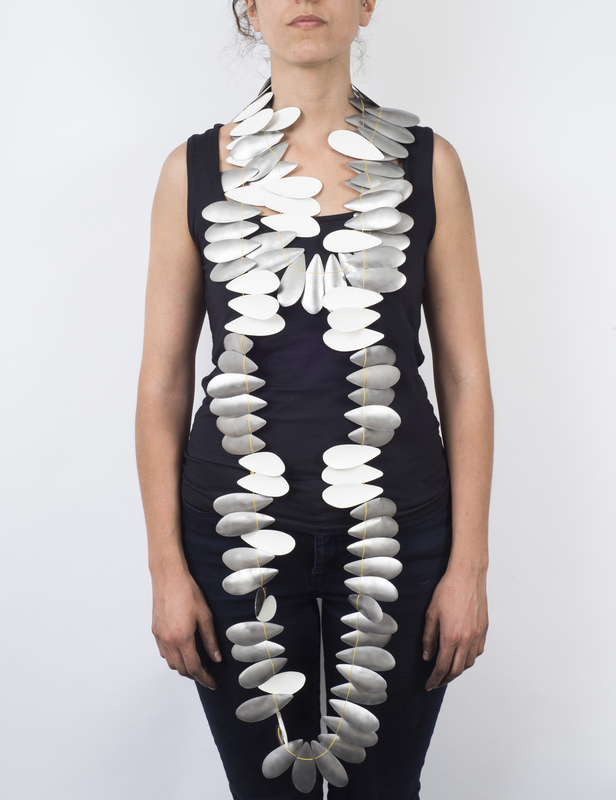 Skin necklaces are made from paper and plastic using programming and laser cutting to manipulate and reproduce the skins’ patterns and textures.